WASHINGTON – The NFL Players Association is proud to announce its inaugural NFLPA Jersey Friday campaign to be held Friday, November 6. The driving force behind the NFLPA Jersey Friday promotion is to give fans the opportunity to show pride for their favorite on-field stars by wearing an NFL player jersey to work, school or play. The NFLPA is encouraging workplaces and schools nationwide to allow employees and students to wear their favorite player’s jersey on November 6 in exchange for a recommended $6 donation to Got Your 6. 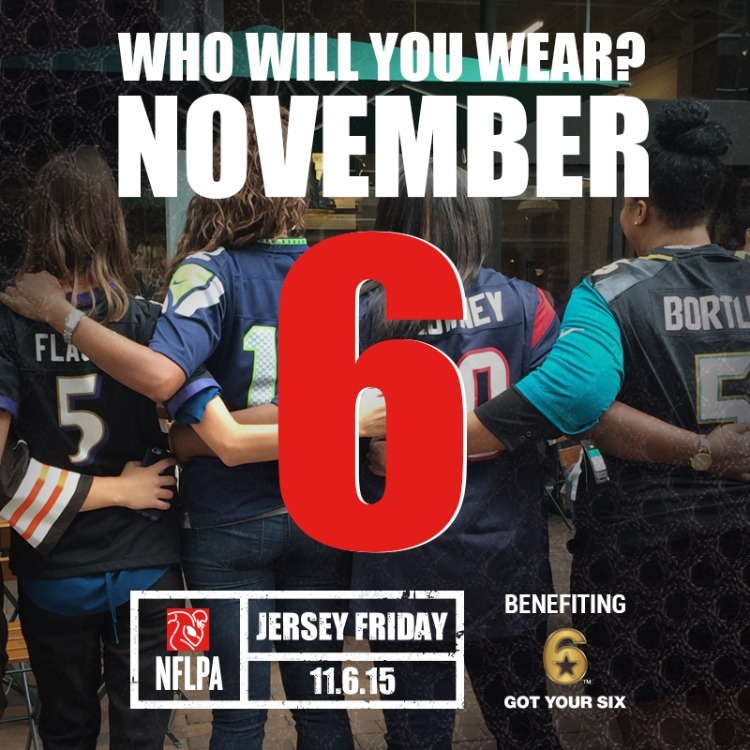 NFLPA Jersey Friday will proudly benefit Got Your 6, an official NFLPA charitable partner. Got Your 6 is a campaign that unites veteran-focused nonprofit, Hollywood, and government partners. The group believes veterans are leaders and problem solvers who have the unique potential to strengthen our communities. One lucky fan has the chance to win a prize for sharing a picture in his or her jersey and a post about why the player on the jersey is his or her favorite. The grand prize winner will receive a donation in his or her honor to Got Your 6, along with signed memorabilia and a personal social media shout-out from his or her favorite player. Fans should stay tuned to social media for messages and instructions from their favorite players in the lead-up to November 6, as well. Follow #NFLPAJerseyFriday to be part of the conversation.